Hello there stamping friends! Welcome to my little part of blogging land. I'm playing along with the challenge over at the Global Design Project #GDP175. They have a gorgeous and fun challenge all about Spring. 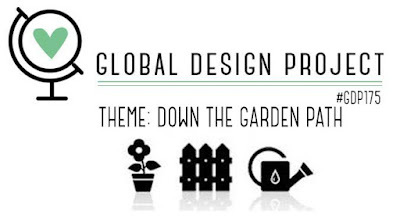 The team over at the Global Design Project want us to share products that take us down a garden path - in the garden or from the garden, with all things plants and beautiful flowers. While its crazy hot here in Melbourne at the moment, with us here in Australia right in the middle of summer, I had to take part in this challenge as Spring would have to be my favourite season. When the colder weather slowly starts to warm up and all the Blossom trees start to bloom it really is a beautiful sight to behold. I'm playing, again, with the amazing Sale-a-bration stamp set, Lovely Lattice, for a spot of water colouring on water colour paper. I usually ,of late, when water colouring use the stunning Shimmery White paper with the beautiful, subtle shimmer. But this time I though I would water colour on actual water colour paper, because I could use a little bit more water when colouring and because I wanted the texture of the watercolour paper to be a feature of the card and the water colour layer. 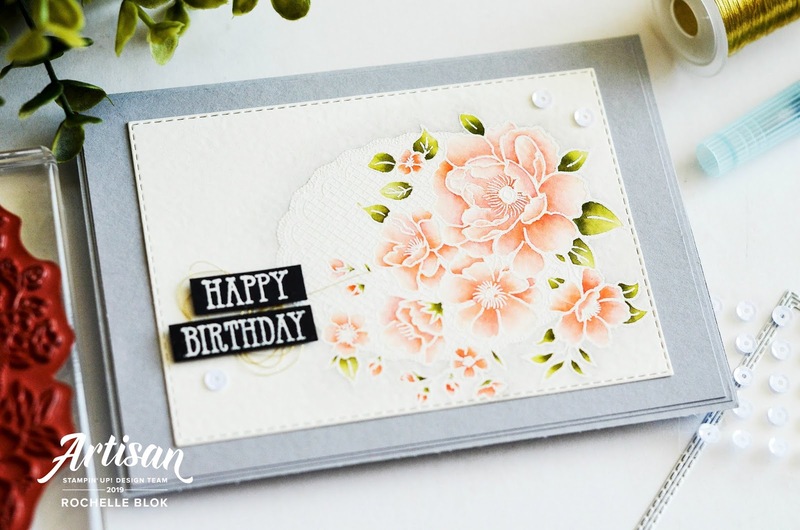 I started the whole process of the card with stamping the Lovely Lattice image with Versamark and the heat embossed the image with White Stampin' Emboss powder. I like to emboss an image when water colouring as it provides a 'border' to each piece of the image and you don't have to be as careful when colouring the image in. 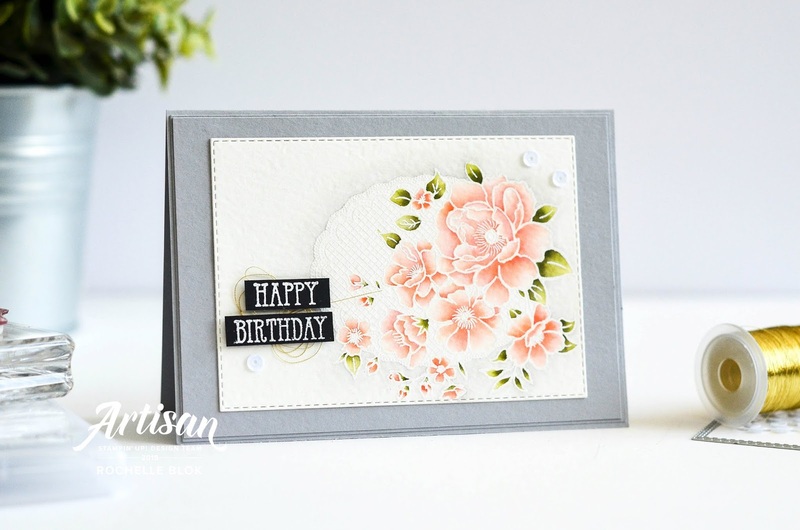 I used Old Olive and Mossy Meadow for the leaf pieces and Calypso Coral and Pumpkin Pie for the flower images to create an orange/pinky/peachy colour. The two colours together almost look like the retired Peek-a-boo Peach colour when water coloured together like that. To finish off the card I used Smoky Slate as an outline around the whole image to give the stamped image a little bit of definition on the paper, so it doesn't look so flat. It almost give the image the look of a shadow and lifts it off the cardstock. I probably could have added more of the Smoky Slate colour to give a bit more of a darker outline but I really like to subtle-ness (if that's a word) of it. Just remember if you want to get the Lovely Lattice set for free, place a $90 (not including P&H) with me HERE and you can choose this gorgeous set for FREE!! 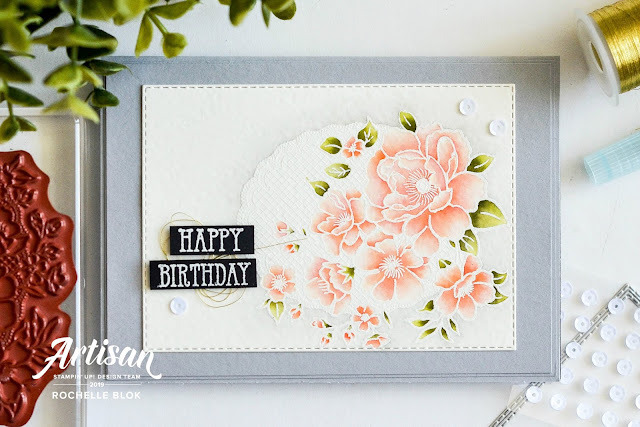 I'm also entering this card in the challenge over at What Will You Stamp? #WWYS205 as this weeks chosen challenge stamp set is - Lovely Lattice. 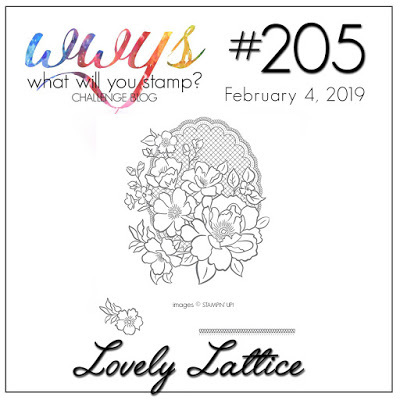 Check out the projects by the design team at What Will You Stamp? They have lots of creative inspiration on how to use this stamp set and I'm sure it will get you inspired. Gorgeous coloring Rochelle! You took this stamp set to a new level! Thank you for sharing with What Will You Stamp? Rochelle - AWESOME Card! Love it - my set is on its way, can't wait to case your lovely creation!